Technology will be key to building a new trust economy and government stakeholders should prioritize transparency and accountability in international markets. New Delhi, India, 8 January 2019 — Sheryl Foo, Director of Vertech Capital, was invited as a panelist at the Raisina Dialogue to share her expertise in the impact of innovation on globalization. The conference was held in New Delhi, India from January 8th to January 10th, 2019. Hosted by the Observer Research Foundation (ORF) in collaboration with the Ministry of External Affairs of the Government of India, the 3-day conference gathered global political heavyweights, ministers, politicians, academics, and industry stakeholders to discuss a range of issues on policy matters and the challenges of the globalization. Raisina 2019 was opened by Erna Solberg, Prime Minister of Norway, and Sushma Swaraj, Minister of External Affairs of India. Keynote speakers include Marise Payne, Minister of Foreign Affairs of Australia; Hamid Karzai, Former President of Afghanistan; and Josep Borrell, Minister of Foreign Affairs and Cooperation of Spain. 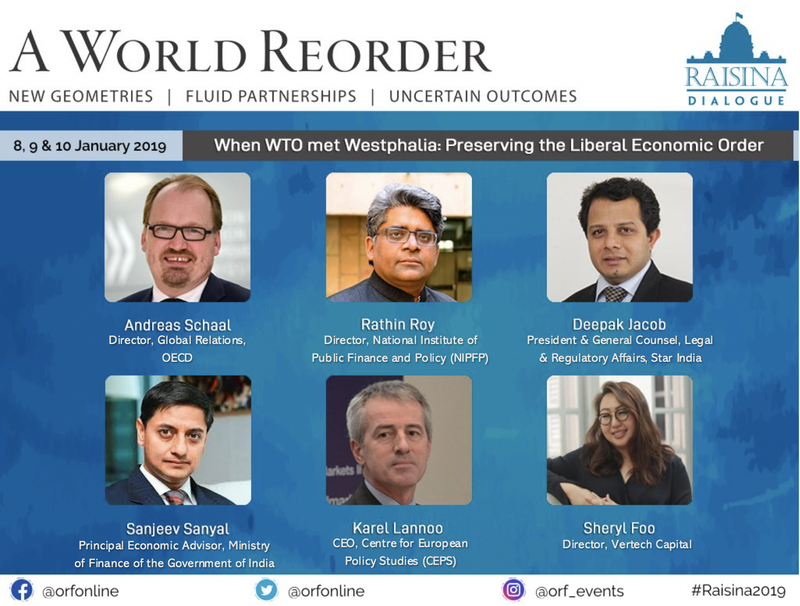 As part of a breakout panel titled “When WTO met Westphalia: Preserving the Liberal Economic Order”, Foo discussed the New World Order in Asia Pacific and technology as both a challenge as well as a solution to address issues in governance. During the breakout panel, it was highlighted that the current liberal economic order is a set of guiding principles for international order shaped and enforced predominantly by the United States. The order sets rules and standards for nation states to work together through tenets of open markets, multilateral organizations such as United Nations, and liberal democracy. The rise of emerging economies such as China and India, however, is shifting global power from the West to Asia. The world is on a cusp of a paradigm shift as support for the current economic order is declining. Information Flows: The illicit movement of information and intellectual property, hindering economic incentive to invest in knowledge creation in free markets. The keynote panelists deliberated on whether the liberal economic order should adapt to meet these challenges, and the rise of a new order with a focus on a China-centric reform. The panelists highlighted that while the liberal order aims to promote capitalism and democracy through alliances and multilateral organizations, a lack of power balance favoring Western economies has created a self-serving agenda. Benefits of the order, therefore, such as market access and aid are offered selectively and exclusively, with countries like China and developing nations connected at the boundary or being excluded from the order entirely. Given the disparity and diversity in economic and political structures across Asia Pacific, there is an urgent need for an economic reform that is far more inclusive. As regional leading powers, China and India operate with open economies and are highly influential in the World Trade Organization (WTO). Emerging economies are now creating new pathways and redefining how government institutions in Asia Pacific cooperate with the West. Foo stated that the new trust economy has to be distributed and inclusive of information flows within and across state-endorsed and non-state actors, including private sector stakeholders and individual citizens. The future of the liberal order will rapidly shift from regulated and centralized methods of information creation and sharing to distributed methods that maintain reputation identity and trustworthiness as a knowledge source. Governments and multilateral organizations should therefore leverage on innovative technologies to create a peer-to-peer exchange of information for transparency and accountability in international markets, as well as enhance their capability to manage and analyze the large volume of data in today’s digital world. Citing examples of the non-zero sum economic approach implemented by Singapore and Japan, who are actively implementing bilateral organizations for data flow to optimize trading efficiency, Foo stressed the importance of technology to level the playing field for decision makers. The role of non-state actors, such as technology giants Google and Amazon, in shaping a new economic order is paramount to ensure data protection and privacy. While other technology giants lead the ‘sharing economy’ revolution, social media has, at the same time, the potential to significantly impact politics, as evidenced by Brexit and the 2016 US elections. As the market reach of technology giants expands globally, the current “state-centric” view of international politics must broaden to include the roles, experiences, and influence of these non-state actors as regulation around data flow and digital diplomacy are prioritized. “In order to reform the system from the inside, we need to look at it from the outside. Otherwise, we will perpetuate existing disparities and imbalances in power relationships,” shared Foo. Other topics examined during the conference include gender empowerment in global governance, financial instruments for sustainable growth, the future of work, and benefits and disadvantages to creating an agile governance framework through a digital revolution. With presence in Asia, Europe, and North America, Vertech Capital aims to build an intelligent innovation ecosystem that addresses the challenges of urbanization. Vertech collaborates with governments, public sector agencies, and multilateral organizations globally to provide market insights by bridging the data intelligence gap between policy makers and innovators. With a focus on cross-border and cross-sector engagement, Vertech is committed to unlocking the full, transformative value of innovation through technology and product commercialization, policy advisory, and thought leadership. For more information visit www.vertechcapital.com. The Raisina Dialogue is the Government of India’s flagship conference on geopolitics and geo-economics, hosted by the Observer Research Foundation and the Ministry of External Affairs, Government of India. The Dialogue is a multilateral conference committed to addressing the most challenging issues facing the global community. Every year, global leaders in policy, business, media, and civil society and hosted in New Delhi to discuss cooperation on a wide range of pertinent international policy matters. For more information visit https://www.orfonline.org/raisina-dialogue/. We connect and curate a global portfolio of cutting-edge technologies and investments.